On the 13/14 when 53 Wellingtons and seven Stirlings were despatched to bomb (Düsseldorf ?). A Missing Research & Enquiry Team reported "The aircraft was on its way to the target at Nuremberg, when it was hit by ack-ack fire from the I G Farben works at Oppou and it crashed near Friesenheimer Insel a small island in the nearby Rhine. The crew was initially buried at Worms-Weinsheim as per CWGC Concentration Report. Son of Henry and Lizzie Dearden; husband of Ada Dearden, of Poynton, Cheshire. Durnbach War Cemetery - Coll. grave 5. A. 18-21. Source: CWGC - photo via Carol Russell, thanks. Age: 20 - °23 January 1921 Cobden, VIC. Son of Alan Leighton Browne and Ada Eileen Rowena Knapman of East Malvern, Victoria, Australia. Brother of Barbara Eileen Browne. Son of Norman R. Jarrett and Doris Elaine Jarrett, of Crowborough, Sussex. Brother of Cicely Jarrrett. Son of Mervyn Claude and Margaret Preece, of Westminster, London. 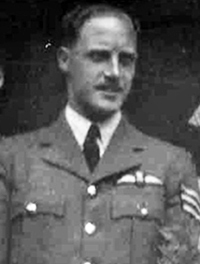 Widdecombe Bernard Frederick - W.Op./Air Gnr. Son of William Alexander and Eveline Stewart, of Edinburgh.